Have I ever told you that my husband and I kind of got engaged on Easter Sunday? And that homemade Hot Cross Buns may have sealed the deal? I say "kind of got engaged" because there wasn't a proposal at all, really, so much as a conversation about the future; a future we committed to create together as a married couple. But there were Hot Cross Buns -- the first batch I ever made, and the first my husband had tasted since leaving South Africa seven years prior. 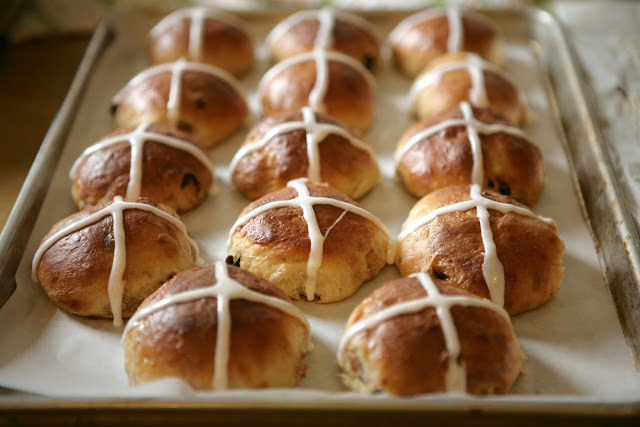 You see, Hot Cross Buns are everywhere in South Africa -- at supermarkets, convenience stores, gas stations -- especially at Easter. But they're nearly impossible to find in Southern California, so I did what I tend to do: I made my own. I don't recall the recipe I used. They were good, not great. I remember thinking they needed more raisins, sugar and spice. But hey, my husband ate them and decided to marry me, and now we have an Easter tradition and a cute story. When I made Hot Cross Buns this year, I used Pioneer Woman Ree Drummond's recipe. It's brilliant in that she calls for layering spiced sugar and raisins in the dough, which by the way is probably the easiest yeast dough you'll ever make. I made it entirely by hand, and as long as your yeast is fresh, it's foolproof. I took only two liberties with Ree's recipe: I doubled the raisins (we really like our raisins) and was more generous with the sugar-spice mixture (mine was heavy on cinnamon, with a dash of freshly ground nutmeg and a pinch of ground cardamom). 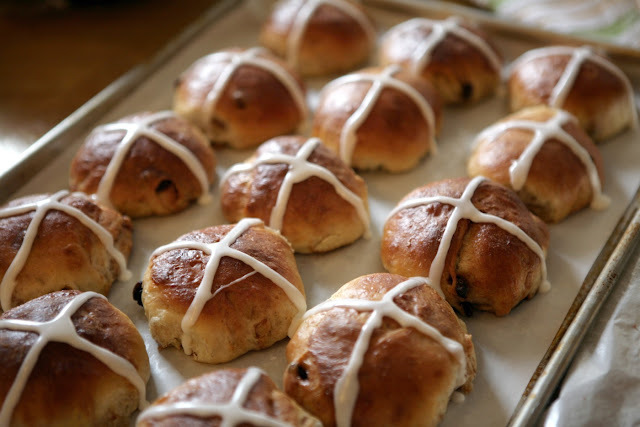 I'm so impressed with your hot cross buns. Brava! Lovely to meet you and thank you so much for your lovely comments on my blog.